Old Kona Airport is located on the western coast of Hawai‘i just west of Kailua-Kona town. At the intersection of Palani Road and Kuakini Hwy turn west and proceed past the old industrial area. Ample parking is available the whole length of the old runway, fronting the beach. 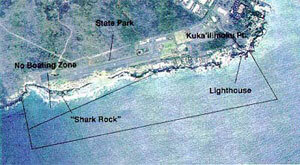 The MLCD includes the waters offshore of the Old Kona Airport State Park and adjacent private properties. It is bounded by a straight line seaward 500 yards from the western end of the park, to a straight line seaward 500 yards from the Kailua lighthouse. A “No Boating Zone” exists in the waters off the park as indicated. The single day use mooring can be found offshore of the prominent “Shark Rock” toward the MLCD’s northwestern boundary. Water depth at the mooring is about 40 feet. A few inlets and sand channels along the park frontage provide swimming entry in calm waters. A reef shelf east of “Shark Rock” provides a surfing break. Between the eastern end of the park frontage and Kuka‘ilimoku Point is a large sandy tidepool just inland of the rocky shore where families often take children to swim. Snorkelers and shore SCUBA divers usually enter the water at a partially protected cove at the northwestern end of the beach. Another diving entry, usable in calm to moderate waters, is at the southeastern end of the old airstrip, where the lava shoreline forms a semiprotected basin and divers can jump into the water. The reef fronting the park consists of numerous low profile shallow fingers of lava, extending offshore to depths up to 50 feet. Beyond this depth the bottom drops off quickly into very deep water. Coral cover is substantial in the area, with a diverse population of reef fishes. Turtles and rays are often seen. Snorkeling is good within about 50 yards of the shoreline. Snorkelers and divers should exercise caution when entering the water due to sharp coral and lava rock along the entire frontage of the park. Dangerous swells and currents along the shoreline accompany summer or winter storms. No lifeguards are on duty at the time of this printing, but are planned in the future. Restrooms, showers, emergency and pay phones. To fish for, take, possess or remove akule by handline at night, and ‘ōpelu by lift or ‘ōpelu net method using bait or chum for commercial or home consumption. To fish for, take, possess or remove any finfish for home consumption by throw net or pole-and-line (without reel) with bait from shore. To collect wana, wana halula, and hā‘uke‘uke with hand tool, and without use of scuba gear, from June 1 to October 1. To use the state mooring not longer than three hours per boat each day on a first come, first served basis for non-commercial use. Commercial dive/tour operations may be conducted at the mooring and from shore with a permit. To fish for, take, injure, kill, possess or remove any marine life, including live sea shell and `opihi, live coral, algae or limu, or other marine life, or their eggs, except as indicated in permitted activities above. To take or alter any sand, shell, coral, rock or other geological feature or specimen, or to possess in the water any device that may be used for the taking or altering of marine life, geological feature or specimen. To feed or introduce any food material, substance or device as an attractant, directly to or in the vicinity of any aquatic organism except for the purpose of catching and removing that organism as permitted. To anchor a water craft in the MLCD, or operate a motorboat or other motor powered water craft within the “No Boating Zone” except for emergency or enforcement purposes. To conduct commercial dive/tour activities except as indicated in permitted activities above.